A towering centre half who spent most of his club career with Leeds United and Manchester United, McQueen started off as a young professional in Scotland with St Mirren. After two years and 57 appearances for the Paisley side Don Revie signed McQueen in 1973 as a long term replacement to the aging Jack Charlton. Gordon helped the Elland road side win the League Championship in 1974 and was a key player in the European Cup run of 1975 although he would ultimately miss out on the final against Bayern Munich due to suspension. Gordon moved to Manchester United in 1978 and was an FA Cup finalist with the Old Trafford club in 1979. He would eventually win the trophy in 1983 after a replay win over Brighton & Hove Albion. 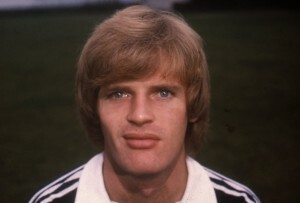 At international level McQueen played 30 times for Scotland and was a member of the 1978 World Cup squad. The most famous of his five goals at international level came against England in 1977 in a famous 2-1 win at Wembley Stadium.